Elephants are an integral part of Kerala culture. It is the presence of richly adorned elephants that gives a majority of the traditional festivals of Kerala a touch of grandeur and glory. Aanayoottu at the Vadakkumnathan Temple in Thrissur district is a ritualistic feeding ceremony (locally known as Aanayoottu) that takes place inside the premises of the famous temple, dedicated to Lord Shiva. 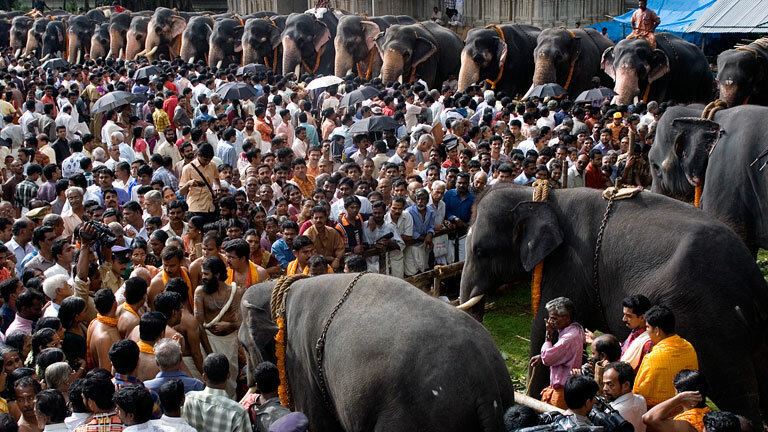 On the festival day the elephants are brought inside the premises of the Vadakkumnathan Temple for the special feast. Here, the elephants are lined-up in a single row and facing them would be thousands of people ready with offerings in their hands to feed the elephants. Sugarcane, rice, ghee, coconut, jaggery and Ayurvedic medicines are the major ingredients of the special feed for the elephants. This ceremony is also rooted in the belief that Lord Ganesha, the elephant-faced God, who removes obstacles in one's life will be appeased if elephants are worshipped and given healthy, delicious food.